The narrator of the novel, the mysterious figure who collects human souls when they die. Death enjoys noticing colors, particularly in the sky, and he is mystified by the contradictory nature of humans—both beautiful and ugly. As World War II continues and he must collect so many souls, he grows weary with his work. All told, she owned fourteen books, but she saw her story as being made up predominantly of ten of them. Of those ten, six were stolen, one showed up at the kitchen table, two were made for her by a hidden Jew, and one was delivered by a soft, yellow-dressed afternoon. When she came to write her story, she would wonder exactly when the books and the words started to mean not just something, but everything. Papa would say a word and the girl would have to spell it aloud and then paint it on the wall, as long as she got it right. After a month, the wall was recoated. A fresh cement page. Books everywhere! Each wall was armed with overcrowded yet immaculate shelving. It was barely possible to see the paintwork. There were all different styles and sizes of lettering on the spines of the black, the red, the gray, the every-colored books. It was one of the most beautiful things Liesel Meminger had ever seen. Liesel, however, did not buckle. She sprayed her words directly into the woman's eyes. "You and your husband. Sitting up here." Now she became spiteful. More spiteful and evil than she thought herself capable. Yes, the brutality of words. He laughed. "Good night, book thief." It was the first time Liesel had been branded with her title, and she couldn't hide the fact that she liked it very much. As we're both aware, she'd stolen books previously, but in late October 1941, it became official. That night, Liesel Meminger truly became the book thief. Yes, the Führer decided that he would rule the world with words. "I will never fire a gun," he devised. "I will not have to." The best word shakers were the ones who understood the true power of words. They were the ones who could climb the highest. One such word shaker was a small, skinny girl. She was renowned as the best word shaker of her region because she knew how powerless a person could be WITHOUT words. That's why she could climb higher than anyone else. She had desire. She was hungry for them. On Munich Street, she remembered the events of the previous week there. She saw the Jews coming down the road, their streams and numbers and pain. She decided there was a word missing from her quote. The world is an ugly stew, she thought. It's so ugly I can't stand it. She tore a page from the book and ripped it in half. What good were the words? The timeline below shows where the character Death appears in The Book Thief. The colored dots and icons indicate which themes are associated with that appearance. Cosby, Matt. "The Book Thief Characters: Death." LitCharts. LitCharts LLC, 18 Dec 2013. Web. 24 Apr 2019. Cosby, Matt. "The Book Thief Characters: Death." LitCharts LLC, December 18, 2013. 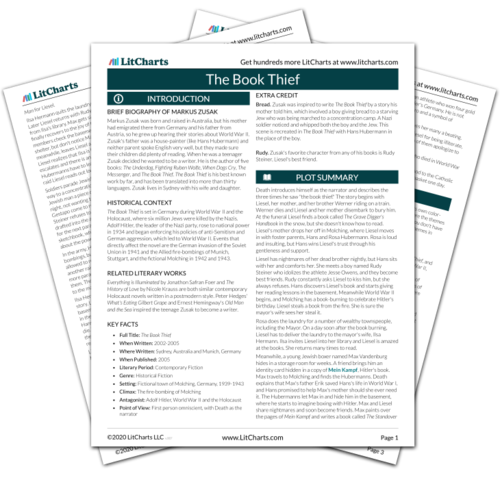 Retrieved April 24, 2019. https://www.litcharts.com/lit/the-book-thief/characters/death.